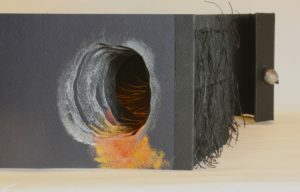 A “tunnel” or “peephole” book is made up of pages bound by accordion folds on both sides and are “read” through a hole in the cover, and a cutout in each page, allowing all pages to be seen at once, front to back. This creates an illusion of depth and perception. 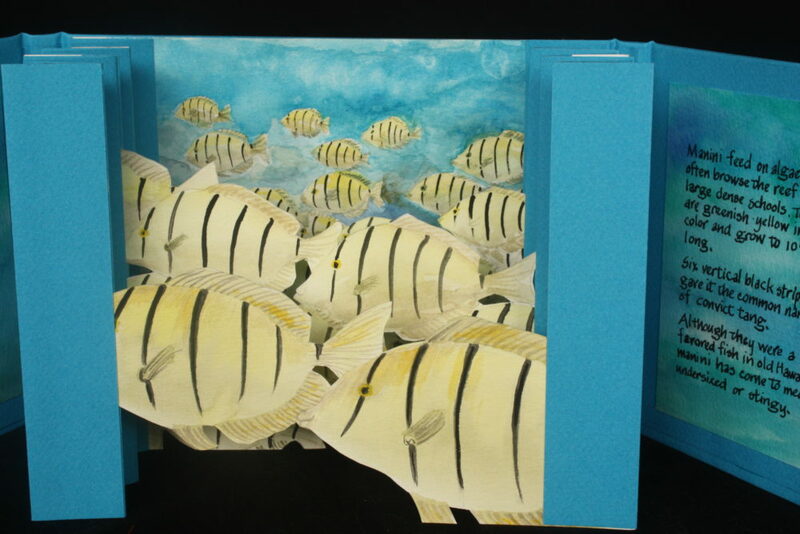 The images on each page work together to form a three-dimensional scene inside the book that helps to tell a story. What will your story be? Be as wildly creative as you want to be! 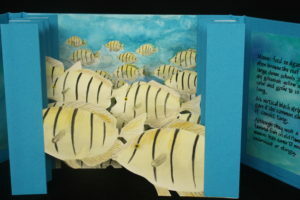 You will learn the basics of constructing 2 styles of tunnel books and design your own models. Join instructor Charlene Asato on Saturday, March 2, 2019 from 9am – 12pm for the “Exploring Tunnel Books” bookbinding workshop at Volcano Art Center Ni‘aulani Campus in Volcano Village. Cost is $35/$32 VAC Members plus a $10 materials fee. Prior bookbinding experience is not necessary, nor is tunnel vision or accordion skills. Tools to bring: X-Acto knife with fresh #11 blade, cutting mat, scissors, pencil, metal edge ruler, bone folder or butter knife, glue stick, old magazine or catalog for gluing. Optional: any art supplies such as colored pencils, crayons, photographs for collaging, scraps of paper, scoring board, portable paper trimmer, punches, rubber stamps or stencils. Asato avidly pursues book arts, paper arts, photography, calligraphy and doll arts. 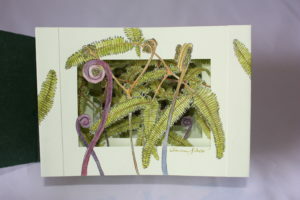 Her books have been in many juried shows, locally, nationally and internationally and some have won awards. She finds it very exciting that a simple fold changes a two-dimensional plane into a three-dimensional form. These artist books provide a wonderful avenue to convey this energy. She enjoys imparting this excitement to others through workshops.